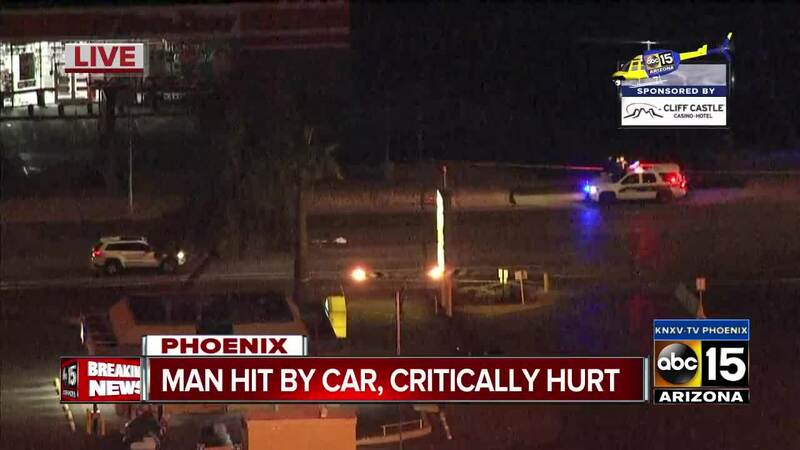 A pedestrian is in extremely critical condition after being struck by a car in Phoenix on Wednesday evening. PHOENIX — A man has died after he was struck by a car Wednesday night while crossing a west Phoenix street. According to Phoenix police, the 55-year-old man was crossing Van Buren Street mid-block near 35th Avenue around 8:15 p.m. when he was struck by a vehicle. The man was taken to a nearby hospital, where he was later pronounced dead. Sgt. Vince Lewis said the driver remained at the scene and showed no signs of impairment. Van Buren Street was closed for several hours Wednesday night as police investigated the crash.